D.Module2.6SLXT is a Spartan 6 FPGA Module, and modular component of the D.Module2 embedded DSP product family - intended for use with D.moudule2 embedded DSP boards and systems. 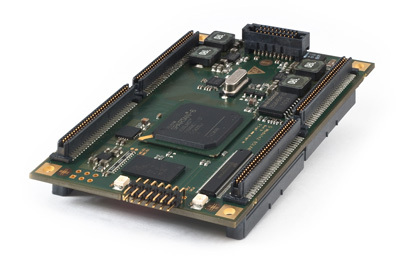 The Spartan 6 LXT FPGA can be programmed to interface with and pre-process data from high speed, high bandwidth peripheral interfaces, relieving the DSP of unnecessary overhead. With the Spartan 6 handling high bandwidth activities, lower bandwidth postprocessing, analysis, and algorithm control can then be more conveniently performed by the DSP processor . Additionally the FPGA can potentially implement supplemental peripherals, such as PWM controllers, frame grabbers, CAN Bus controllers, etc. Peripherals and data acquisition subsystems can be connected to the FPGA through a maximum of 98 user definable single-ended signals (48 LVDS signal pairs), and up to three Gigabit links. These I/Os conform to the industry standard VITA 57 FMC specification. A suitable prototyping platform, the D.Module2.Base-FMC, providing an an FMC LPC mezzanine site together with accommodation for a D.Module2 stack. The DSP is by default connected to the FPGA via the D.Module2 32-bit wide parallel bus interface. Depending on the DSP capabilities alternative data paths exist: Serial Rapid IO (SRIO) on the GTP connector and LVDS (e.g. TigerSHARC® Link Ports) on the EXP connector. The EXP signals are available as free user-programmable I/O if not used for DSP-FPGA communication, e.g. as a base mode CameraLink. The Spartan 6 GTPs (Gigabit Transceivers) provide additional high-speed connectivity interfaces like SRIO for inter-board communications, JESD204/A as a high-speed A/D and D/A interface, SGMII to interface a Gigabit Ethernet PHY, SATA, DisplayPort 1.1, and PCIe v1.1. The DSP has full access to the FPGA configuration Flash Memory and can re-configure and update the FPGA at any time. Other key features are programmable I/O voltage, 128M Bytes local DDR3 RAM and a JTAG interface for FPGA programming and debugging via Xilinx ChipScopeTM. usable as additional User-I/O if not used for DSP-FPGA communications.